The presence of the friars in Derry is an enigma. There is evidence for a small residence there from 1687 on, and a strong local tradition of a Franciscan presence in the Waterside and Ardmore areas. The only friar associated with the city was Fr. Francis Gallagher, who taught in the seminary there before his death in 1806. 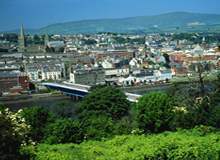 Despite the lack of an official connection, Derry has been a great source of vocations for the Order.